After the Early Paleoindian period, deer hunting ruled the region, much as it does today. In prehistoric times, of course, there were no rifles, corn feeders, and high-dollar leases, but deer were the most important game species for much of the last 11,000 years. No doubt, when bison herds were present in the region they must have taken over as the top prey, but archeological evidence suggests that bison appeared only rarely in the region after about 9,000 B.C. Deer reigned supreme during the lifetimes of most prehistoric hunters living in the Plateaus and Canyonlands. Small game (rats, rabbits, birds, and reptiles) were probably more regular menu items, but several lines of evidence show that deer hunting was a defining aspect of prehistoric life in the Plateaus and Canyonlands—economically, socially, and ritually. Careful analyses of animal bones recovered from open archeological sites across the region typically show that deer contributed the greatest amount of meat to the diet. Keep in mind that dry-cave coprolites tell us that prehistoric peoples ate rats, mice and lizards essentially whole—bones and all. The bones of these species, other small animals, and fish are usually underrepresented in the archeological record. But among the bones that are preserved, deer were usually the most important prey, except during intervals when bison appeared. Even when bison do appear, it is easy to jump to false conclusions—the distinctively big bones of bison in archeological deposits tend to catch researcher's eyes and imaginations. But careful zooarcheological studies (bone analyses done as part of archeological research) result in calculations of the actual number of animals represented and how much meat they contributed to the diet. For instance, at the Mustang Branch site near San Marcos—a site with prominent bison bone refuse—zooarcheologists determined that deer actually contributed more meat to the diet than bison. Given the documented ecological and land use changes in modern times, the prehistoric deer of the Edwards Plateau were probably a lot less numerous and noticeably larger in size than is the case today. The combined impact of livestock overgrazing, soil erosion, cessation of range fires, increase in juniper, and the selective, but strictly limited, harvesting of male deer have resulted in deer overpopulation and small body size on the Edwards Plateau. In prehistoric times, things were different. One study of deer bones from mainly Archaic deposits at the Panther Springs Creek site on the north side of San Antonio found that the adult deer bones were consistently larger than modern comparative examples from the area. The size difference was so great that the graduate student who did the study at first thought that the bones might have been those of mule deer rather than white tails. But white-tailed deer they were, and we can infer that they grew to larger sizes because their populations were held in check by nature and year-around deer hunting. There are also several lines of indirect evidence pointing to the importance of deer hunting to prehistoric peoples. One major clue is the abundance of well-made dart points at Archaic-period sites all across the Edwards Plateau. After the end of the last Ice Age and the disappearance of most large animals, the atlatl and dart weapon system was really only suitable (or needed) to hunt two game animals—deer and bison—and humans. There were also bear, mountain lions, and antelope, but only the latter was likely hunted regularly and then only in the open grassland habitats they frequent. Bear and mountain lion bones are rarely found at archeological sites. It, however, must be acknowledged that deer and antelope bones are similar in size and shape and can’t be easily distinguished, especially when fragmentary. Still, the ecology of the region strongly suggests that deer predominated in most of the region, and it seems reasonable to infer that most dart points were primarily designed with deer in mind. The symbolic and ritual importance of deer is also shown in the vivid rock art of the Lower Pecos canyonland. 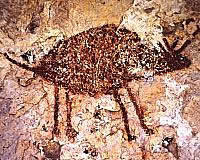 Here deer are commonly depicted whereas bison are very rarely if ever shown. Human figures, perhaps shaman, are shown wearing deer antler headdresses. And in some scenes deer antlers are shown tipped with small, round black dots that anthropologist Carolyn Boyd interprets as representing peyote. Among the Huichol Indians of northern Mexico, deer and peyote are symbolically linked to rain because both appear prominently in the desert after rainfall. Boyd thinks that Lower Pecos rock art depicts a similar symbolic link. Finally, just off the edge of the southeastern Plateau in present day San Antonio a small Late Archaic cemetery (41BX1) was uncovered during a dam construction project in the late 1970s. 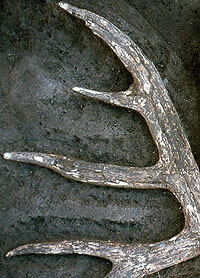 One of the distinctive human burial patterns there was the practice of placing numerous racks of white-tail deer antlers over the graves of men, women, and infants. This pattern (which has been seen elsewhere) is thought to reflect a symbolic link between deer and human afterlife. The apparent association with adult burials may well reflect the use of deer as a social status marker. 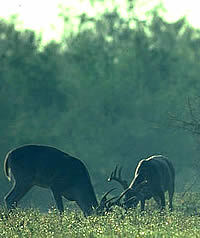 Mature bucks, male white-tailed deer, seem to have been desired by prehistoric hunters as much as they are today. Deer bones from an archeological site on the edge of the Edwards Plateau near San Antonio, Texas suggest that prehistoric hunters had a far better chance of encountering large white-tails that most hunters have today. Photo courtesy Texas Parks and Wildlife. View across a partially exposed bone bed (Feature 15) dating to the Toyah interval at the Mustang Branch site on the eastern edge of the Edwards Plateau near San Marcos, Texas. 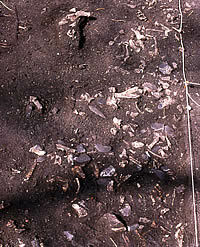 Amid the fragmented bones are numerous stone tools including a complete beveled knife near the center of the photo. Most of the bones in this dense, midden-like deposit were those of deer and antelope with a small amount of turkey and turtle. Although bison hunting is an important part of Toyah culture, this bone bed shows that deer (and to a lesser extent, antelope) remained major food items. Photo from TARL archives. Close up of an animal figure, probably representing a deer, as depicted in Red Monchrome style rock art in the Lower Pecos canyonlands. Photo from ANRA-NPS archives at TARL. Drawing of a Late Archaic burial covered with nine white tail deer antler racks (attached to deer skull fragments). The antler racks were obviously placed over the body as an offering, suggesting that deer were symbolic links between life and death. The deceased was a young woman estimated to be 16-19 years old who lived about 1900 years ago (ca. 100 A.D.). 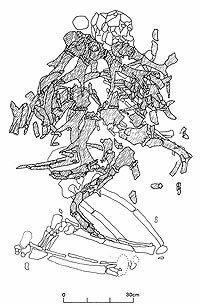 She was interred in a prehistoric cemetery in the Olmos Basin in San Antonio; the graves were encountered during dam construction work. From Lukowski, Paul D., 1988, Archaeological Investigations at 41BX1, Bexar County, Texas. Archaeological Survey Report 135, Center for Archaeological Research, University of Texas at San Antonio. Impressive 5-point white-tail deer antler as found at the Rush site near San Angelo, a 16th century site where at least 50 bison also were killed by Toyah hunters. This find shows that deer were hunted even when bison were around. Photo by Mike Quigg.